For all that I’ve been shameless in my promotions over the past months, there has been one task that I dreaded. I hate spruiking my book to bookshop managers. I imagine them silently resenting having to sound warmly welcoming when they’re under so much pressure these days from changes to the book industry. But four bookshop managers have been extremely kind. Lynda Carmody at the NLA bookshop in Canberra took copies and walked me though the unfamiliar paperwork. She gave me gentle and invaluable advice about how to price my book in ways that would be fair to both me and booksellers. Jessica Rowe at BookFace in Gungahlin seemed delighted to be supporting a local author; it was as if I was doing her a favour! James Redden at Harry Hartog couldn’t have been more warmly supportive, offering his space as a possible launch venue when I was getting nervous about fitting everyone into our own home. And Mark Rubbo at Readings in Carlton took copies despite me not being a Melbourne author or a regular Readings customer. If anyone out there is looking for a copy of the book and lives in either Melbourne or Canberra, do visit one of these bookshops. I owe them. Thank you to the 120 people who have responded with a YES to the invitation to the Book Launch. That’s too many for our house, so I’ve been looking for an alternative. I’ve written to the UC Inspire Centre, the Canberra Grammar Gallery, the Ainslie and Gorman Arts spaces, University House and have chatted to a bookshop owner. I’ll follow these up early next week. For those coming to the launch, I’ll email each of you once the new venue has been organised. "So Steve, how's the book doing?" It’s a question I keep getting asked. Until yesterday, I wasn’t sure how to respond. I’ve sold a couple of hundred copies, some via Amazon and some I’ve sold directly, and the book launch is still a month away, so I guess that’s pretty good. I suppose if sales are the measure of how the book is doing, I won’t know until after the main publicity burst around the launch on 26 March. If visits to my Squarespace website where the novel is featured are any guide, interest is growing. 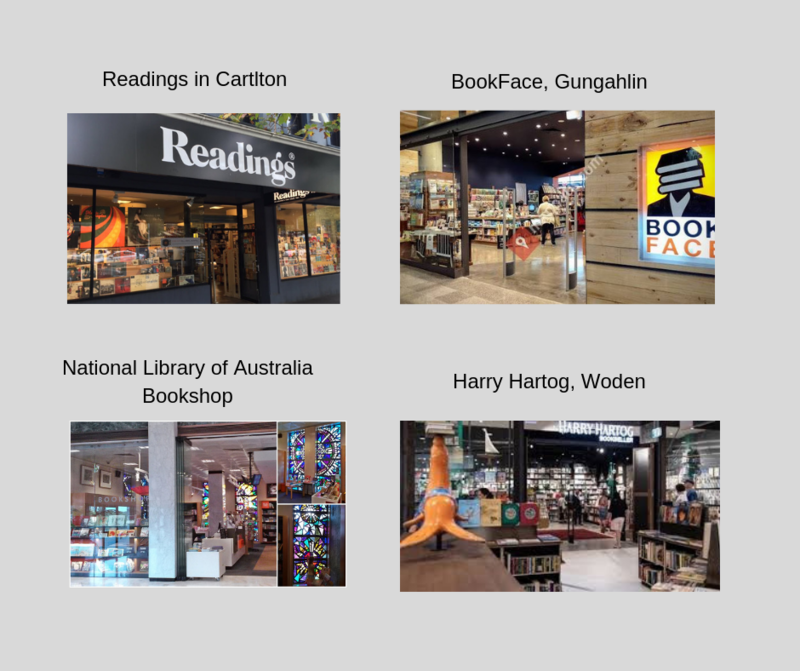 There are now three bookshops - Readings in Carlton, the National Library Bookshop and Book Face in Gungahlin - who have agreed to stock it, and a number of other Canberra and Melbourne bookshops are looking at it as I type. So that’s good. We have 122 people who have sent RSVPs to say they’re coming to the Book Launch. That’s exciting. But I was reminded again yesterday, when I friend told me she was about to read the book for the second time, that none of the above are the metrics that matter. It’s what people have been saying about the experience of reading the book. An American teacher wrote to me via Twitter last week, and it’s comments like these which make me feel that the book is doing just what I hoped it would do. The Harriet page on my website has most of these comments, and the short film here has snippets from many of them. In my last blog, I asked for advice about writing a study guide for The Worlds of Harriet Henderson. Twelve members of ‘my community of knowledgeable peers’ replied, and their advice has given me three clarifying insights. 1. I don’t like the idea of readers studying my novel. I want people to read it, and I want to do everything possible to encourage as many readers as I can. Perhaps the study guide idea was, for me, a way of enticing teacher educators to get their pre-service teachers reading my book; naturally I want pre-service teachers to read my book. But I don’t want them to study it. Mary talked in the comments about the experience of entering into the world of the novel, and how a premature exposure to a study guide might interfere with that. 2. If there’s guiding to be done, I want the novel to do the guiding, not me. When I’m teaching students in schools or at university, or when I’m leading teacher groups, what works best almost every time is when I introduce some material and then ask two questions: What did you notice? What did you wonder? The ensuing discussion is then determined by the material and the readers’ experience of it, not by my own preconceptions or agenda. I think an approach based on these two questions would lead to the kinds of discussions and explorations listed by Misty and Brenton in their comments on my last post. 3. I’d rather spend my time doing other things rather than writing a study guide. I want to start writing the next novel. I’ve also got some ideas about creating some kind of online space for an emerging and potential community of knowledgeable peers. And I’d love the opportunity to discuss the novel face-to-face with groups (students, teachers, readers). I’d find all of that kind of thing much more appealing than writing a study or reading guide. Thank you all who commented. Whether you were encouraging or discouraging of the idea, your thoughts helped bring me some clarity. I do feel blessed by these collaborations. A Study Guide for 'The Worlds of Harriet Henderson'? A former colleague has encouraged me to have a go at creating a study guide for my novel, The Worlds of Harriet Henderson, for use with pre-service teachers in universities or with English teachers as part of PD courses. Some of the reviews from teachers and teacher-educators have hinted at something similar. I’m not sure. It’s the kind of project I’d enjoy working on, but would it be useful? I thought I’d flag the possibility here, have a go at the beginning of a study guide, and see what others think. I’d love some thoughts from those ‘in the field’: teacher educators, pre-service teachers, English-teachers-thinking-back-on-their-pre-service-experience. If encouraged, I’ll spend hours happily working on this, but I don’t want to do it if it wouldn’t be useful. The planning, even if I do say so myself, has been meticulous. Jo and I have gone through multiple drafts of The Worlds of Harriet Henderson and edited out every error we can find (and still one gets through - it’s ‘toe the line’, not ‘tow the line’!). I’ve created a new edition so that I can have my own ISBN instead of the one assigned by Amazon. I’ve set a date for the launch, planned the event, issued invitations and have had about 100 acceptances. I’ve assembled a Launch Team to help with publicity in the fortnight leading up to the launch. I’ve spruced up and aligned all my various sites - webpage, Amazon author page, Goodreads author page, social media pages - so that all roads lead, sooner or later, to information and reviews about the novel. I’ve sent out pdf copies to over 100 readers and have now nearly 30 reviews, some on Amazon, some on Goodreads and all on my website. I’ve got reviewers from Netgalley, and have created a Book2Look biblet so that anyone can read the first chapters before deciding whether or not to buy the book. Sol and I have made a video of the making of the cover, and I’ve made a short film with quotes from various readers. I’ve let Australian library services know about the book, and have copies ready to send to potential reviewers. I’ve sold or got orders for around 100 copies, which I’m bundling up and delivering or posting, and next week I begin approaches to bookshops and local libraries, armed with a flyer that Sol and I have created. I’ve been collecting photos of readers with their copies of the book (all genuine!) and publishing these on social media. And that’s only the half of it. But Harriet’s there/Competing for air/We’re hoping she’ll soon leave the nest! Overdoing it or not, I’m ready. I’ve planned. I’ve left no stone unturned. Not known as a details person, I’ve attended to every one of them. Like it was for Napoleon, that brilliant and meticulous planner. One of my all-time favourite novels is War and Peace. I read it when I was at university (when I should have been reading my political science texts), and then again a couple of years ago. There’s so much I love about it. But it’s the portrayal of Napoleon, and of what actually happens in battle despite the best laid plans, that I keep thinking about these days. From the battlefield adjutants he had sent out, and orderlies from his marshals, kept galloping up to Napoleon with reports of the progress of the action, but all these reports were false, both because it was impossible in the heat of battle to say what was happening at any given moment and because many of the adjutants did not go to the actual place of conflict but reported what they had heard from others; and also because while an adjutant was riding more than a mile to Napoleon circumstances changed and the news he brought was already becoming false. .. The marshals and generals, who were nearer to the field of battle but, like Napoleon, did not take part in the actual fighting and only occasionally went within musket range, made their own arrangements without asking Napoleon and issued orders where and in what direction to fire and where cavalry should gallop and infantry should run. But even their orders, like Napoleon’s, were seldom carried out, and then but partially. For the most part things happened contrary to their orders. Soldiers ordered to advance ran back on meeting grapeshot; soldiers ordered to remain where they were, suddenly, seeing Russians unexpectedly before them, sometimes rushed back and sometimes forward, and the cavalry dashed without orders in pursuit of the flying Russians … All their rushing and galloping at one another did little harm, the harm of disablement and death was caused by the balls and bullets that flew over the fields on which these men were floundering about. As soon as they left the place where the balls and bullets were flying about, their superiors, located in the background, re-formed them and brought them under discipline and under the influence of that discipline led them back to the zone of fire, where under the influence of fear of death they lost their discipline and rushed about according to the chance promptings of the throng. My planning may well have been meticulous. The outcome, though, will probably be determined by the chance promptings of the throng. Postscript: The image of Napoleon and his generals above is a detail from a much larger painting depicting the Battle of Eylau in 1807. Here’s the full painting. The outcome of the battle was inconclusive. In my blog post ‘What’s it all about?’, I told the story of my son Oliver encouraging his workmates at Jack.org in Toronto to ‘support a lovely old man ‘ by buying The Worlds of Harriet Henderson. This morning I received these photos.